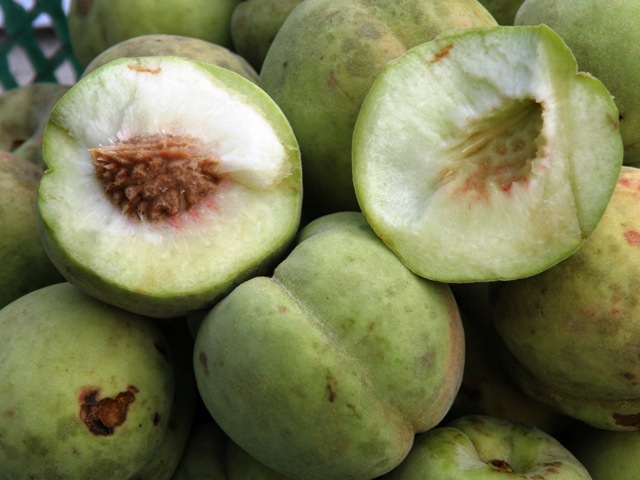 Many wild forms of peach are found in the Indian state of Himachal Pradesh. One of these forms is called kateru, which is also sometimes called kataki aru The most distinguishing feature of this form is the very late ripening of its fruits. The fruits of this wild plant ripen at some places as late as October (Katak or Kartika month of the Indian calendar) and probably that is why they are called kataki aru. 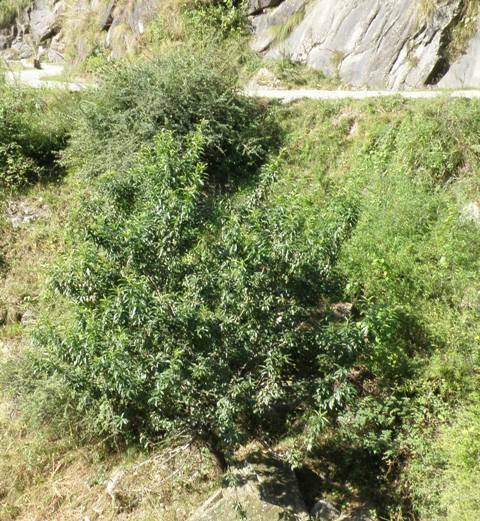 These wild peaches are found in plenty in the Kandaghat area of the Solan District, the Rajgarh region of Sirmur District and in some places of the Shimla District of Himachal Pradesh. A medium-sized deciduous woody tree, 6 to 8.5 metres high; branches,slender; bark, varying from brown to black; thin bark can be peeled off in circular pieces by hand, exposing the dark surface underneath; the girth of main stem is 71.5 cm. Leaves, broadly lanceolate, coarsely serrated, long-pointed, 9.5 cm long and 3.5 cm broad; petiole, 5 mm long. Flowers, solitary, sessile, ebracteate, hermaphrodite, complete, actinomorphic, pentamerous, perigynous, Rhoadacmine purple 29/3; diameter, 3.1 cm; calyx, gamosepalous, five-lobed, sepaloid, more or less pubescent from outside; corolla. polypetalous, with 5 petals, regular, orbicular, clawed, white to pink; length, 1.6 cm; aestivation, imbricate; androecium, polyandrous, numerous (stamens 35 to 40), bithecus, dorsifixed, regular, free at the base, 1.3 cm long; gynoecium, monocarpellary, unilocular, perigynous, 1.5 cm long; placentation, basal. Fruit, a drupe, short-stalked, with free stone, soft and pubescent at maturity, globular to oval, having a prominent suture all around the fruit; length, 4.5 cm; diameter, 3.8 cm; weight, 35.5 g; volume, 35.1 ml; almost green, turning light yellow at maturity. Stone, rough and very hard; 2.1 cm long and 1.5 cm in diameter; weight, 2.52 g; weight of kernel, 1.8g. Flowering starts from the middle of March and lasts for 15 to 20 days. In the case of some of the trees, it continues till the middle of April. 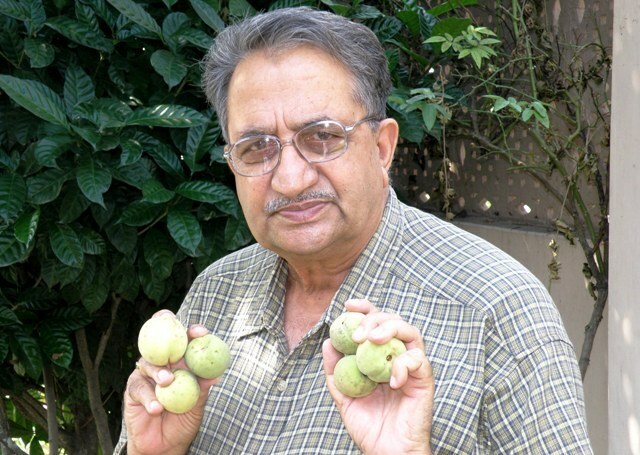 The fruiting season under, Kandaghat conditions, was observed to be from the first week to the last week of September. The fruiting season. like the flowering season, also varies with the altitude, and in the Sirmur District, it occurs from the first week to the last week of October. The average yield of a full-grown tree is 36.5 kg. The pulp of the fruit contains 68.2 per cent moisture. It contains total soluble solids, 61.1 g; acidity, 1.71 g; total sugars, 5.20 g; reducing sugars, 2.40 g; non-reducing sugars, 2.66 g; vitamin C, 2.304 mg, all per 100 g. The protein content of the pulp is 2.00 per cent. The mineral content of the edible portion, as represented by its ash, is 1.634 per cent. The percentage content of some of the mineral elements, viz., phosphorus, potassium, calcium, magnesium and iron is 0.057, 0.566, 0.039, 0.034 and 0.009 respectively. The leaves of this plant are anthelmintic, insecticidal, useful in leucoderma, and piles. The flowers are used as a purgative. 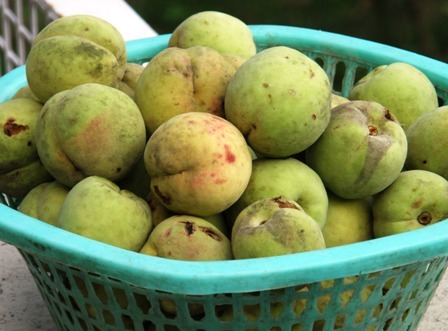 The fruits are a tonic for the brain, enrich the blood and remove bad smell from the mouth and the sputum. These are also useful in lessening thirst, biliousnes and kapha disorders. The oil from the kernels is an abortifacient, good in piles, deafness, earache and stomach troubles of children. The fruit is given as a demulcent, antiscorbutic and stomachic. In China and Malaya, peach kernels are used to treat coughs, blood diseases, rheumatism and ague. It may, however, be mentioned here that it has not been clarified by any of the workers referred to above, whether their statements relate to the wild form kateru or some other form of wild peach. The fruits are sweet with a blend of acid. These are more acidic than those of the cultivated types. However, they are edible. The overall fruit quality is fair to good. The fruits are eaten by the people in the villages. A comparison of their chemical composition with that of the superior cultivated types given in Appendix 11 reveals that these wild peaches are richer in nutrients than the improved cultivated varieties. Trials should be conducted for their evaluation for processing purposes. Considering their overall fruit quality, they should make a good canned product. The late-ripening characteristic of this wild peach is unique. This plant can be used as one of the parents in the hybridization programme for evolving some late-ripening peach variety. A peach variety ripening after the monsoons shall be a boon to the Himachali peach-growers as all the varieties recommended at present ripen during the peak monsoon period. Owing to heavy rains, the roads are often blocked and this blockage hampers the transportation of peaches. The keeping quality of the late-ripening peach shall also be better owing to the cold weather prevailing at that time. The seeds of this wild peach are collected and sown for use as a rootstock. An oil is obtained from the kernels of this plant. This oil resembles the oil from bitter almonds, for which it may be substituted.